Why Valence bond theory is introduced? molecule. Hence a new theory is developed which helps to explain the shape of atomic orbitals, electronic configuration of elements, overlapping and hybridization of atomic orbital, which is known as valence bond theory. The metal atom or ion must have vacant s, p, and d-orbital for the accommodation of electron donated by the ligand. The suitable number of vacant orbital of comparable energies of metal undergoes hybridization. 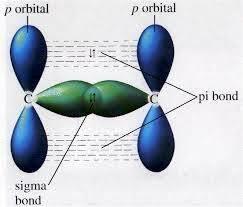 The orbital after hybridization have the same energy and these orbitals are called hybrid orbitals. The hybrid orbitals overlap with the ligand to form coordinate bonds. Based on the pattern of overlapping, there are two types of covalent bonds i.e. sigma bond and a pi bond. The covalent bond formed by sidewise overlapping of atomic orbitals is known as pi bond whereas the bond formed by overlapping of atomic orbital along the inter nucleus axis is known as a sigma bond. Ligands are classified into two categories i.e. weak ligand and strong ligand. Strong ligands have the tendency to pair of the electrons whereas weak ligands have no such tendencies. It could not explain the nature of the ligand whether the ligand is strong or weak. It could not explain the pairing of electrons in the presence of strong ligand. It could not explain colour and electronic spectra of complexes. It could not explain the effect of temperature on the magnetic moment and magnetic susceptibility. It could not explain the deviation of experimental magnetic moment from calculated by the spin only formula. It could not explain the kinetics and mechanism of reaction in complexes.